That gifted people around the globe are able to meet fundamental needs via proactive engagement with their gifted peers. Our reference for "fundamental needs" comes from bottom-up development models which plan community growth, development and sustenance based on meeting human needs. 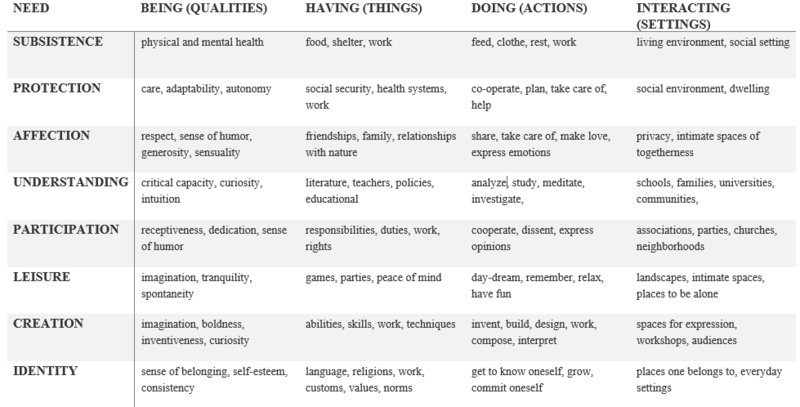 Of particular interest to IG is the Human Needs and Human-scale Development Model, from economist Manfred Max-Neef, whose matrix of needs below helps us considering what needs we are meeting and how we are offering to meet them within the IG Community. To provide the infrastructure, support, education, guidance, opportunity, and professional development opportunities that allow gifted people to proactively meet their fundamental needs with and among their gifted peers. Proactivity, collaboration, solidarity, kindness, promoting knowledge on giftedness, and promoting good living for gifted people. WHERE DO YOUR VALUES & NEEDS ALIGN WITH OURS? Here are some ways that InterGifted supports members in meeting fundamental needs. You can use this list as a self-identification tool to see what needs you currently have, and where you want to proactively engage in the InterGifted community.